Katie and Bella, her ukelele! Check out the live recording below of Katie leading her 50 piece percussion ensemble at Hitchin's Summer Music Course 2017! 'It's been great to have Katie Patterson as drum and percussion tutor for Hitchin Music Project Summer Course 2017. Katie was absolutely brilliant at running the percussion section of our large mixed ability orchestra in every style from Latin to jazz to marches and orchestral repertoire. Our young percussionists were encouraged to be ready and fully engaged for every piece and I know that they were inspired to play way beyond their usual level – I love that! The icing on the cake was Katie involving the whole course – around 50 people of mixed age and ability – in a fantastic samba school style drumming workshop. It was amazing to see this group transformed into a really tight unit in very short order. 'Just a note to say thank you so much for allowing our group and others to have the wonderful experience of 'Katie's Allsorts Trio' in Hillsborough yesterday afternoon. It was a fantastic performance which was greatly enjoyed and appreciated by everyone who attended. We managed to gather around 40 people including support staff to participate. It soon became a bit of party afternoon with everyone dancing, singing, performing. They had a ball!!! Katie has been doing a variety of workshops (see below) since 2005. If you are interested, please contact her to get a detailed price quote! Katie with Allsorts Trio (Aron Kyne & Pete Gavin) giving a workshop on behalf of Live Music Now at St. Wilfrid's Centre, Sheffield. Team building workshops are designed for people who have never played drums before. 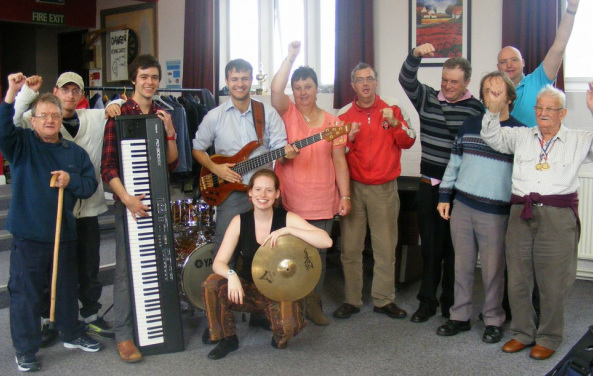 Fun, empowering and exciting, Katie opens the doors of music to everyone to enjoy. These workshops are suitable for any age and are great for community groups, work parties, birthday parties, any social clubs and anything else you can think of! ​The rhythm section (drums, bass, guitar, piano/keyboards, percussion) is the foundation for great ensemble. Booking a workshop with a specialist gives insight into the specific roles of each instrument and can help musicians understand how to play as a collective unit. 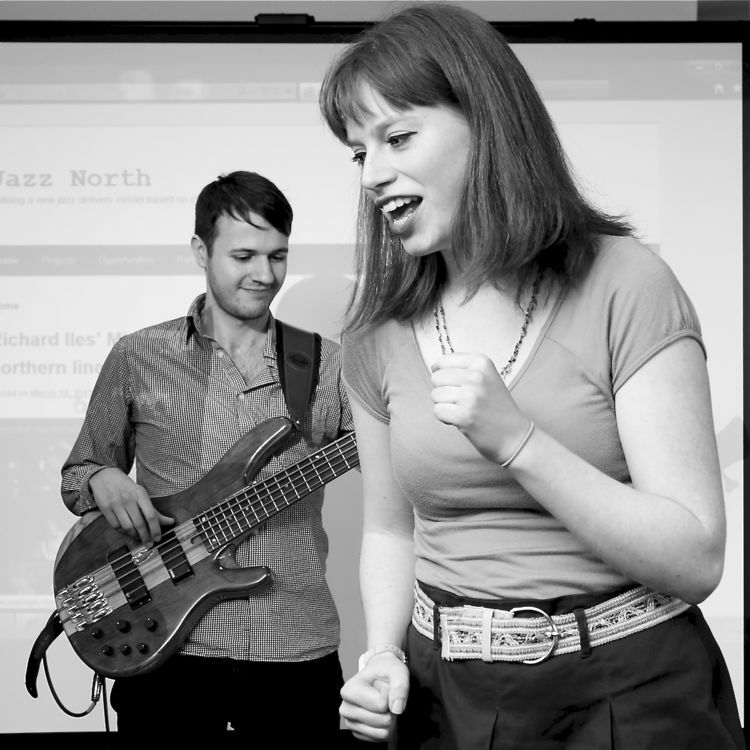 Book a workshop with Katie for your community, school or other band and hear the results. Current repertoire of the band can be the focus, or Katie can prepare games and exercises to help your rhythm section play their best. She can also augment the workshop by bringing the rhythm section from her band 'The Allsorts'. This way, concepts can be properly demonstrated, and each pupil can get a mini lesson. Also, giving your band the chance to play with professional musicians will inspire and excite. Katie and her rhythm section are very experienced with jazz, big band, rock, latin, hip hop, funk and many other styles of music. Katie working with the members of Musical Arc delivering a workshop @ Hunslet Carr Primary School in Leeds, June 2012. "I hired Katie to do teambuilding workshops with the Morley District Rangers and with all sections of 12th Morley Scouts (Beavers to Scouts). She arranged a variety of exercises and was excellent at energising both groups. Katie was easily able to communicate with the groups of girls and boys. Both groups really enjoyed their sessions and I wouldn’t hesitate in recommending her to Scouts, Guide and Youth Groups." 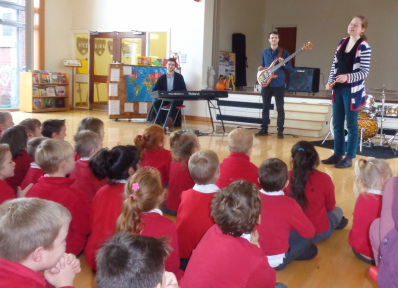 Katie's Allsorts Trio on behalf of Doncaster Community Arts delivering a workshop in a primary school. Katie delivering a workshop at Leeds College of Music, Winter 2012. Katie loves to give workshops to drummers. She designs her workshops to suit the general level of attendees and tries to create a program of material that will leave everyone excited about playing music. She encourages all students to play and demonstrate whilst promoting a fun, relaxed atmosphere with no competition. Katie also likes to include activities and games to include all drummers to make everyone feel part of something. Book Katie to come to your school, music camp, festival, community centre or anywhere that has a bunch of drummers wanting to learn and play!